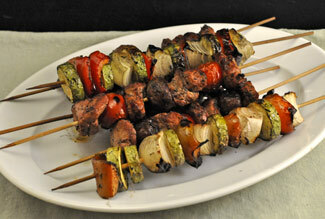 Grilled Lamb Kebabs, Thyme for Cooking easy gourmet dinners. 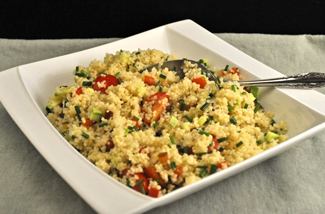 Reserve a bit of the pepper and zucchini when making the kebabs to use in the couscous. The avocado will be finished on Sunday. If you have any goat cheese left, eat it as a snack or on toast - or stuff some celery with it. If you prefer you can substitute pork or turkey for the lamb. A thin layer of polenta, covered with a creamy avocado and goat cheese spread, paper thin tomatoes, and a bit of Prosciutto and olives: a simple 'stack' for summer. Heat chicken stock to boiling in a small saucepan. Stir in polenta and cook, 5 minutes, stirring, until very thick. Lightly oil 2 dishes with flat bottoms, about 3" in diameter. Spoon the polenta in, flatten it and allow to cool completely. Mash the avocado and goat cheese together with a fork until well combined and creamy. Pit and slice the olives. Remove the polenta circles and put on 2 plates. 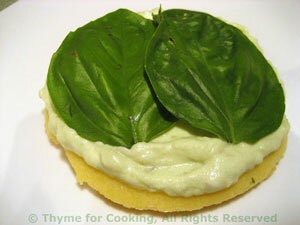 Divide the avocado cream and spread to the edges of each polenta circle. 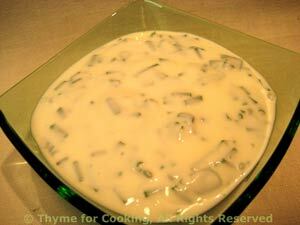 Lay the basil leaves on the avocado cream. 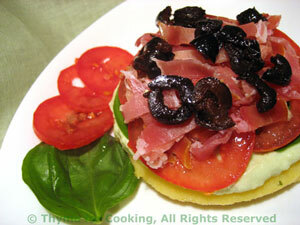 Top with the tomato slices in an overlapping circle. Add the Prosciutto and olives. Garnish with anything leftover..... Serve. Note: Leave the unused portion or half of avocado in the skin. Sprinkle with lemon juice, wrap tightly in cling film and store in the fridge, cut side down, on a plate. Use within 2 days. In this case we'll use it Sunday.